Glenafton fought back from two down at the break to defeat Larkhall Thistle 3-2 in the West of Scotland Cup 1st round match at Loch Park as the visitors finished with 9 men. The Glens created a couple of chances in the opening encounters both of which created decent saves from keeper Alan Colquhoun the first a Chris Malone shot from the edge of the box and the second a close range glancing header from Mick McCann. However the visitors looked lively with the forward play of Graham Gracie in particular catching the eye and on 12 minutes took the lead after Ryan Innes capitalised on a defensive lapse to gather a ball from Gary McStay and slot the ball home from close range. The visitors doubled their lead on 20 minutes after Scott Nicol and Gracie combined in the box to set up Gary McStay and the former Shotts midfielder duly obliged with a sweetly struck shot that gave keeper Brian McGarrity no chance. Thistle continued to press and three minutes later McGarrity got a strong hand to a cross from the left by Gracie and pressure from Craig Menzies prevented from McStay making more of the chance to bury the loose ball. Although the home side struggled to sustain any fluency in their play the occasional half chance was still being fashioned. On 32 minutes Joe Andrew’s through ball into the box saw McCann give defender Niall Reynolds the slip before angling a shot from the corner of the six yard box only for the keeper to be well placed to gather the shot safely. The visitors quickly broke upfield and after a powerful run down the left Gracie forced his way into the box only for his shot to be deflected over the bar by Ally Park and the Glens mop up the resultant corner-kick. 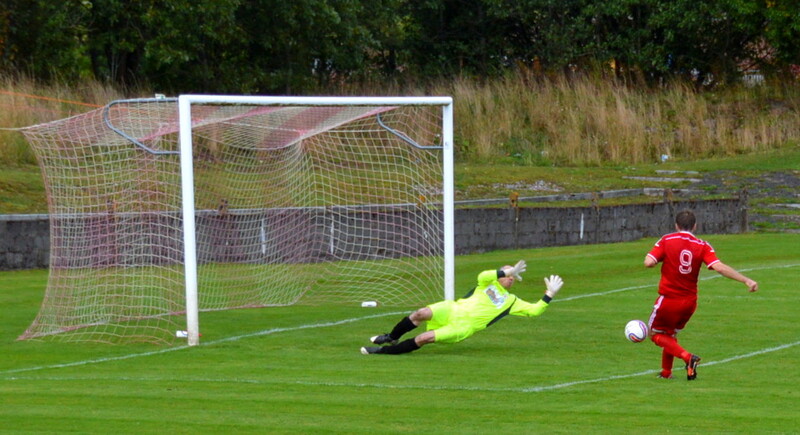 Gleafton enjoyed their best spell of pressure in the closing 10 minutes of the half and on 38 minutes a free kick from 25 yards cannoned off the Larkie wall and the loose ball snapped up by McCann to drive into the box only for Colquhoun to pull off a great save as the stiker tried to curl his shot beyond the diving keeping into the corner of the net. Glenafton replaced Dan Orsi and Joe Andrew with Chris Meikle and Craig McGuffie and within a minute of the restart had halved the deficit. Park stormed down the right flank and shook off the attention of Paul Burns and although his cut back from the goal-line was blocked by Neil Schoneville he quickly recovered the ball and rolled it back to Craig McGuffie at the corner of the 18 yard box to take a touch before curling a cute shot into the far corner with keeper Colquhoun rooted to the spot. To add salt to their wounds, during their next attack, Larkhall half-hearted appeals for a spot kick were waved away. On 50 minutes Park’s tackle in the middle of the park sparked a melee and when the bodies had been separated defender Schoneville received his marching orders and Burns booked for his protests; the latter replaced by Mark McKeever soon after. The home side’s tails were up and Thistle conceded a couple of free kicks on the outskirts of the box, neither of which tested the keeper. Malone then slipped a fine pass to McGuffie who twisted and turned in the box and on this occasion his curled shot lacked the power and height to beat Colquhoun. 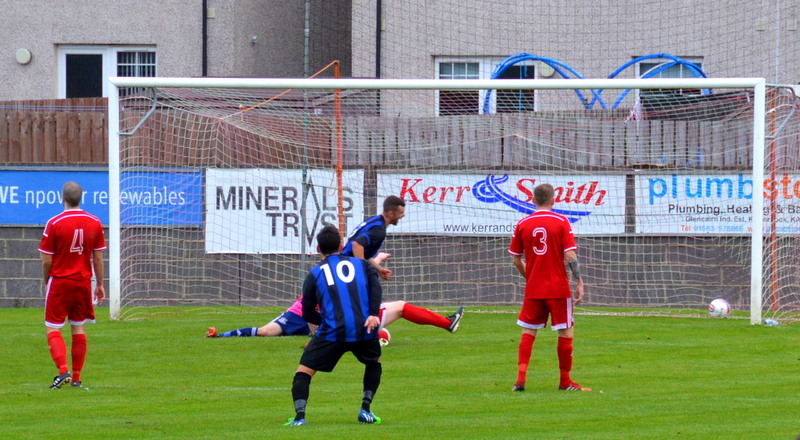 On 65 minutes Glenafton drew level from a well-executed corner-kick that saw Ryan McChesney win the aerial battle to head the ball back to the edge of the six yard box where Ally Park soared head and shoulders above two defenders to loop his header in at back post as Colquhoun clambered to get a hand to the ball. Two minutes later McGuffie shrugged off one defender before bursting into the box and with another defender tracking his movement he picked his moment to slip the ball to Darren McGill who drilled a low angled drive beyond the keeper from 8 yards out. Glens continued to push forward and another powerful run down the right by Park ended with his cut back clear by Reynolds as McCan waited to pounce and Thistle cleared the corner-kick that followed. The visitors replaced McStay with Andy Brown and with 15 minutes to go were reduced to 9 men after the luckless Gracie earned a second yellow card. The hosts created several more chances including a lob from McGuffie that beat Colquhoun but dropped over the bar and a shot from McCann that also beat the keeper but hit the post. In the last minute of regulation time the keeper joined his team-mates for a corner-kick and as the Glens defence scrambled the ball clear it fell to Jordan Marshall only for his shot to be blocked in the box by Meikle initiating cries for hand ball. While theses appeals were waved away Glens broke upfield and McGill’s attempt to find the empty net from some distance out sailed over the bar. Glenafton earned another couple of corner kicks that came to nothing while Colquhoun went upfield for a long throw-in which also came to nothing and the final whistle saving him the spring back to his own goal. 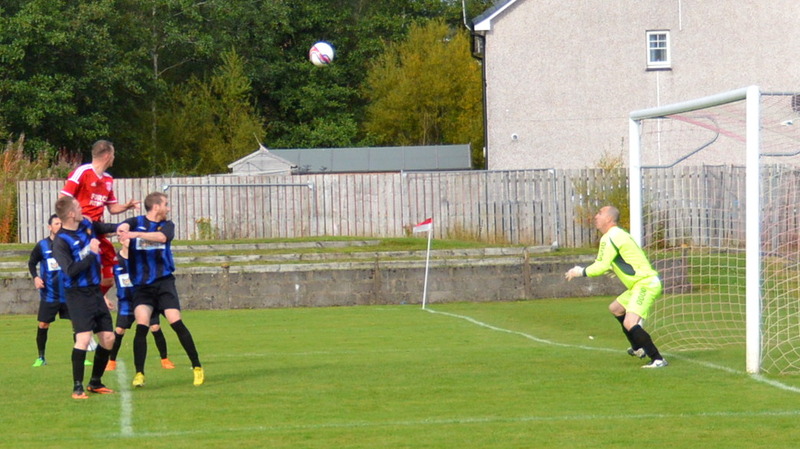 This entry was posted in GAFC Match Report and tagged Glenafton Athletic, New Cumnock, Scottish Junior Football. Bookmark the permalink.